This day, the Feast day of St John and Paul, is generally acknowledged as the fateful day when the Pied Piper of Hamelin lured the unfortunate children of that small German town away from their homes and to their deaths. According to tradition, the dreadful events took place in 1284. The town of Hamelin, so the legend goes, was overrun by rats, and its citizens looked for someone to rid them of the infestation. A stranger appeared, wearing pied, or multi-coloured, clothing, claiming he was a rat-catcher who could, for a fee, rid the town of its problem. The townspeople engaged the stranger, who set about his task in a strange way, luring the rats from their hiding places by playing a wooden pipe. He led the rats down to the banks of the Weser River, where in a trance like state, they were drowned. The citizens rejoiced, but their good fortune did not prompt them to pay the piper, who angrily vowed revenge. He returned to the town at a time when he knew the adults would be in church, and once again played his pipe. This time the town’s children fell under the piper’s spell. The fate of the children varies in the many different versions of the legend that exist, but most are in agreement that 130 girls and boys were taken, never to be seen again. It is a tale that is difficult to verify, as contemporary accounts of the event do not exist. The legend of the piper is based upon a combination of legend, supposition, and perhaps even some facts. The first mention of an incident is to be found in the town’s chronicle for the year 1384, which states “it is 100 years since our children left.” From this point on, stories of the piper began circulating, and from the 14th century onwards the legend was truly established. There are a multitude of theories as to the origins of the tale, several of which have a plausible basis. One notion is that the story was born out of a great tragedy in the town, possibly a plague-like illness, which led to the demise of its children. In this context the figure of the Pied Piper could be perceived as a representation of Death, who was often portrayed in medieval times playing a flute. The story might equally have its roots in the migratory phenomenon known as Ostsiedlung, which constituted the mass movement of German people eastwards during the middle ages. The “children leaving” might have been a poetic way of saying that the town experienced a mass exodus. A further theory is that the piper was a flamboyantly dressed recruiting officer, who convinced a large number of the town’s people to leave town for some sort of campaign. 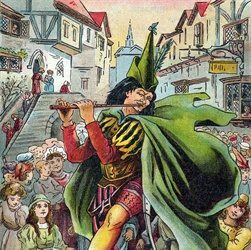 The true origins of the Pied Piper legend might remain elusive, but that does not detract from its longevity. The tale continues to be told and re-told, not least in Hamelin, where it occupies a vital part in the town’s consciousness. Caption: An illustration from a children’s book of the Pied Piper leading away the children of Hamelin, circa 1899.